Windows Live Planet: Microsoft has launched it's new Social Networking Portal in INDIA. 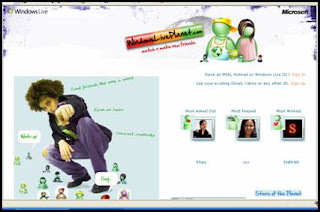 Windows Live Planet (www.windowsliveplanet.com) - Match n Make new Friends!!! Windows Live Planet platform is designed from Idea where usually we hang around with our friends in evening's at our favorite real world destination. It is an effort to bring your real world hanging and roaming habit of checking out interesting faces and making lots of new friends! Windowsliveplanet.com is a Microsoft India initiative, the program has been designed to allow you to find people that match you. All you need to do is complete your profile: I am (demographics), I do (habits), I feel (attitudes) & I like (interests), and Windows Live Planet will open up a whole new world! The match-meter automatically suggests friends, and even lets you find friends exactly the way you want! There is no limit to the number of friends that you can make. You can also find your favorite Windows Live Messenger right within the web page, so you can chat and stay connected with all your new and old friends. What’s more you can ‘Populate Your Planet’ by inviting friends from across networks like Facebook, LinkedIn, Hi5 and MySpace and see how they match up with you. You can find me at Windows Live Planet by searching my name Afzal Khan Give a try by your own and add me!